Our sister site REMODELING spoke with Chip and Joanna Gaines. Chip and Joanna Gaines are well-known for their HGTV show “Fixer Upper,” which guides Texas families through painstaking whole-home remodels. They’ve recently announced that season five will be their last. But, just because the stars will no longer be onscreen doesn’t mean the couple will slow down. 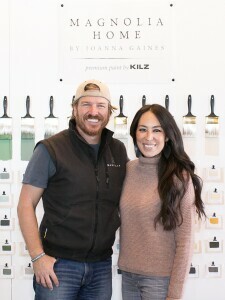 Joanna has been partnering with KILZ to develop her own line of paint called Magnolia Home by Joanna Gaines. Chip recently partnered with KILZ as part of the KILZ Visionaries campaign. Despite their busy schedules, REMODELING spoke with the Gaineses about farmhouse chic–the look they catapulted into stardom–and what design trends they think will be popular in 2018. Why is farmhouse chic such a big trend right now? Joanna: When I think of home, I think of Chip, the kids, and the memories we’ve created there. For a lot of people, including myself, the modern farmhouse style feels timeless—the perfect backdrop for a colorful life filled with simple pleasures. It’s clean, tasteful, and inviting. How can the country’s production builders add these types of design features to their homes? Chip: The great part about Jo’s style is that both large and small design features can go a long way. I’ve always loved the challenge of bringing her vision to life and, along the way, I’ve learned quite a few tricks when it comes to construction. Incorporating sliding barn doors, shiplap accent walls, and exposed beams are good places to start. We learned in the beginning that choosing quality materials was a must. What is your top piece of design advice for a builder or remodeler who has never done farmhouse chic design? Chip: It’s all in the details and finding the right places to add those touches of farmhouse character. Jo and I start each project by taking a step back from it to see if there’s anything already there, like an exposed brick wall or original wood floors, that we can work with. For a new build, don’t get so caught up in the style that you overdo it! Pick just a few, carefully considered ways to incorporate your vision of the modern farmhouse look. What do you think the next big look will be for 2018? Joanna: I think 2018 will bring with it a renewed focus on curation and simplification. More and more, people want to spend their time and money on experiences, rather than stuff, so selecting items for your home has become a more intentional process. Rooms aren’t designed to just look beautiful anymore—they need to be practical, as well. More high-end, sophisticated pieces may give way to, for example, a classic weathered wood table that’s perfect for family meals or even afternoon coloring sessions. Our house is our sanctuary, and like many homeowners, Chip and I like to surround our family with timeless, meaningful pieces that bring a sense of calm and comfort. I believe we’ll see a lot of homeowners doing the same in 2018. Several paint companies have announced their picks for colors of the year. What color(s) do you think will be top in 2018? Joanna: My design projects often feature classic neutrals, such as whites and grays. However, Chip and I love to add a touch of color and lately have found ourselves utilizing a wide variety of blues in our designs work. So, I’m going to go out on a limb here and choose a bold color from my collection with KILZ: Weekendaeducaurzwutsxuzbyaazta! It’s moody and optimistic. I love how bold it is and yet, doesn’t feel overwhelming. How would you incorporate those color(s) you mention above into a project?